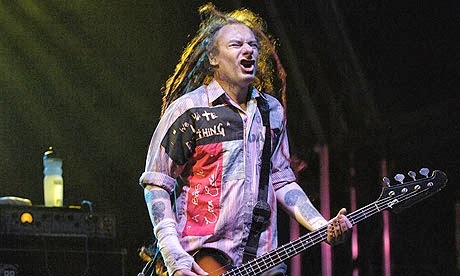 This week 'Songwriters talk about Songwriting' interviews Jeremy Cunningham, bass player and one of the founder members of The Levellers. Founded in Brighton in 1988, The Levellers long successful career includes such highlights as a number one UK album with 'Zeitgeist', several appearances at Glastonbury on the Pyramid Stage, and appearances on Top of the Pops and BBC Radio 1 and 2. Here Jeremy, who also does the artwork for the band, shares his songwriting tips. How does songwriting work within The Levellers? I'm the bass player in the band (and I do the artwork) and I also write some of the words. The breakdown basically is that our two main singers, Mark and Simon, write lyrics and music (ie their own songs), sometimes I'll write words for either if them and they'll add the music. The other guys in the band all write music but not words for these songs and we all do the arrangements. So it's pretty much a team effort. That's why our tunes are always credited to all of us, even though one of the singers may have written pretty much all of it - or very little: that's the way it goes. That way too all the songwriting money gets split equally, so we never argue over money!! Do you find you normally start with a melody or lyrics? I only write words but I always write them to a rhythm (or to anyone else's tune) because our singers will be playing guitar when they sing them (and write the appropriate music). Do you think that melody is the most important aspect of a song? No, it's the words. How long does it take you to write a song? Could take minutes or months. Could you explain a little about the writing process behind a few of your songs? I've got a book I note down ideas in- from one line to whole songs or more. Then I'll join up the lines and fill in the blanks or edit down the long ones, or just use what's there as a trigger for something else.... Hopefully better! But I've got loads a great lines that I've never been able to make work as proper songs too- yet. What songs that other people have written do you particularly admire? My favourite songs change but classics I suppose are 'London Calling'- Clash, 'Exodus' - Bob Marley, 'Ohio' - Neil Young. Do you think that a technical knowledge of theory is important or does it get in the way? Theory in all art I suppose is useful but can also be inhibiting... We work more in intuition, especially those of the band who are self-taught. Do you tend to revisit your songs and rewrite them? Yes I re-visit words over and over again. But Mark, our lead singer, is much more an initial creative impression, he doesn't change his words much when he's written them, though he may work on the music. Have you done much co-writing, and if so what do you see as the benefits? We've never really done any co-writing. Got enough between us. Who do you view as great songwriters. Who has inspired you musically/ lyrically? I really admire the bands I mentioned in question seven, plus Led Zeppelin, Public Enemy, Crass, The Libertines and new bands like Tame Impala, Wolfpeople, Syd Arthur, plus more trad folk guys like Christie Moore, Bob Dylan, the Bothy Band. Do you have any idea where you ideas come from? Ideas come from all of the above (especially question 13!).. Do you have any advice you'd like to share with budding songwriters out there? Only advice I've got I say the same every time I'm asked- make sure you write the truth as you see it and hopefully enjoy doing it, because there's no guarantee (quite the opposite) that you'll get anywhere in terms of (especially commercial) recognition etc! But if you're telling the truth and getting off in it, that's infectious and folk buy into that commitment. So that's my advice, for what it's worth. 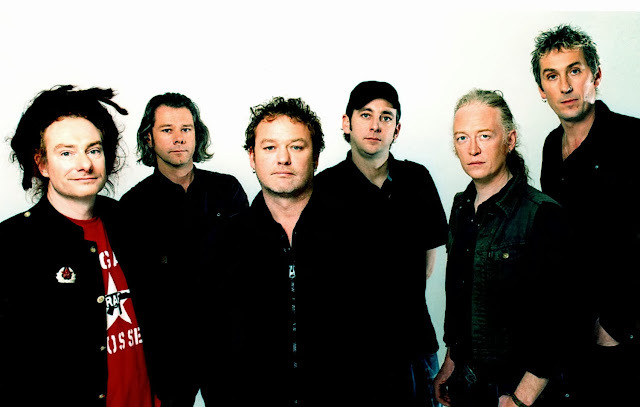 Click on the following to find The Levellers on the web.